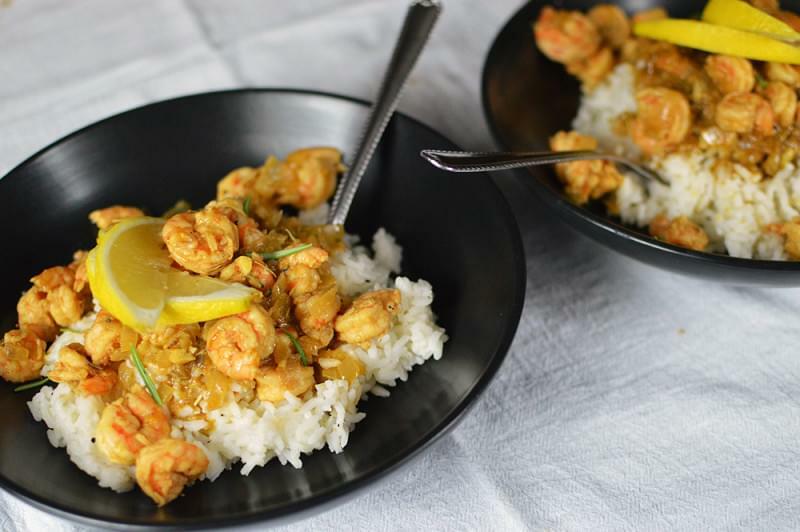 This is one of my favorite recipes we cook, and I’ve been wanting to share it for a while. Actually Greg is the one who usually cooks it, and this was my first time attempting. 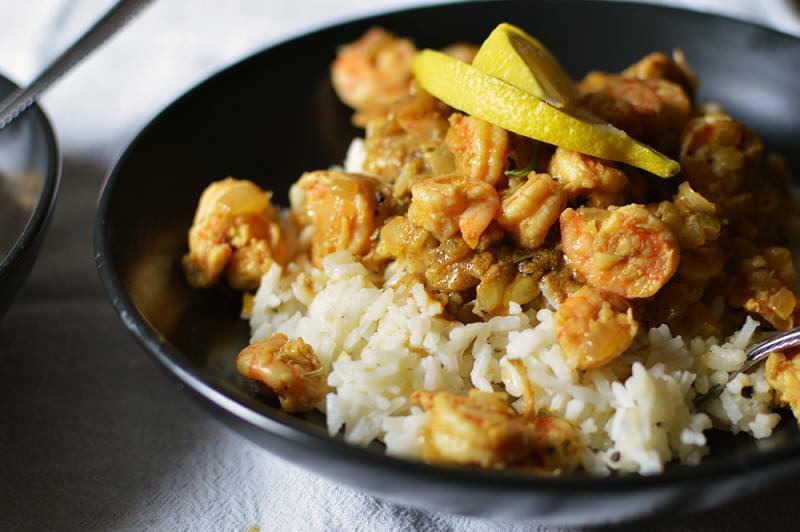 It’s a recipe called “New Orleans Barbecue Shrimp.” Now if you’ve never been to New Orleans, you’re missing out on some of the best food of your life, and pure craziness. And pure awesomeness. The recipe is actually a clipping from an old newspaper article of Greg’s grandparents. He introduced it to me a few years ago, and told me his grandparents used to cook it for him when he was younger and he loved it. He definitely grew up with a more complex palate than I did. Mine was bland until mayyyybe college.. and it’s been expanding ever since. I wouldn’t have had this dish at a young age.. I liked shrimp, but not spice. And definitely not onions (back in the day.) Today, I’m a HUGE fan of onions, spice, and much, much more. Thank goodness palates change people. Most of them do, anyway. The actual newspaper clip with the original recipe is buried around in the house somewhere, and we had tried a few recipes that are similar, but could never recreate it without that clipping! I finally made an awesome discovery! When I was looking at the recipes I had submitted to our drug store’s cookbook, I found it! I had submitted it about three years ago, and the recipe is published in this cookbook! There it was, plain as day. I had the the whole time, I had just forgotten. Our drug store created a cookbook with submissions from family and friends of the community to help our Relay for Life team. As soon as I spotted the recipe in the cookbook, I took a picture of it and sent it to Greg. Then, I requested to have it for my birthday! It was just as I remembered – spicy, buttery, and savory. 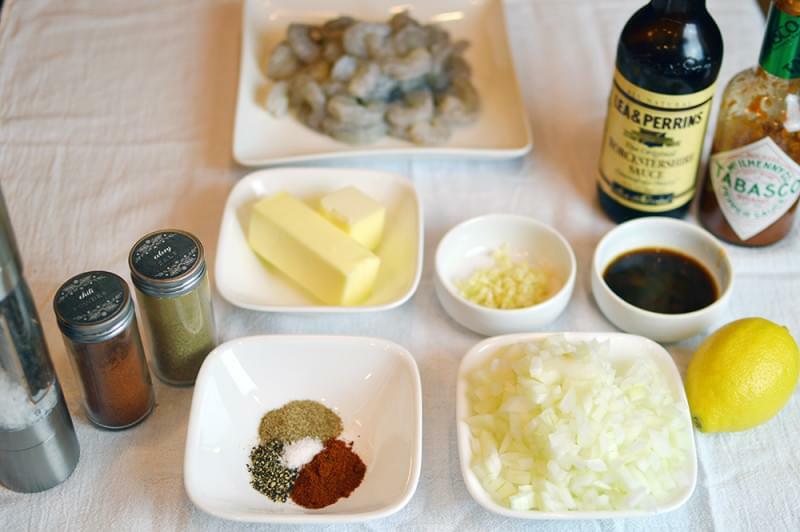 The shrimp works so well with the garlic, onions, lemon and spice. I like to use fresh large or extra-large shrimp from the gulf. We have a favorite seafood shop in Bon Secour (about 15 minute away) that we visit anytime we want to cook shrimp. 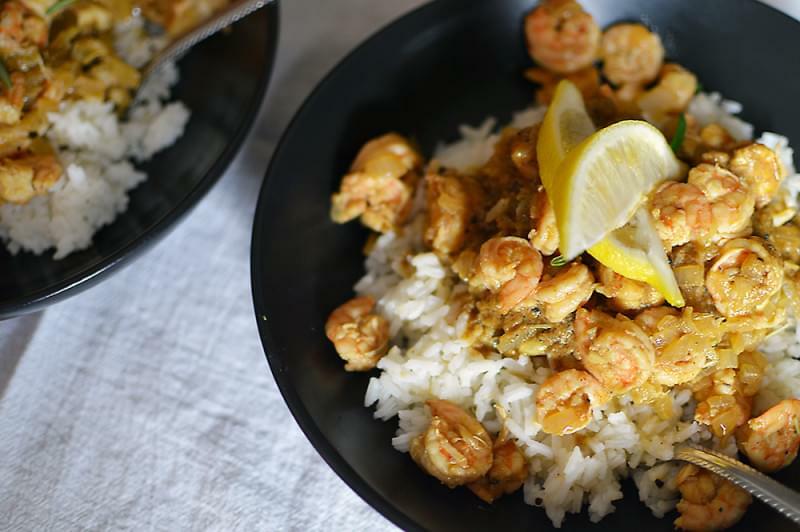 There’s nothing better than fresh from the boat seafood.. but frozen will work in this recipe as well. Now, New Orleans barbecue isn’t the normal way you think of barbecue — it doesn’t have to do with the method of cooking or the barbecue sauce. 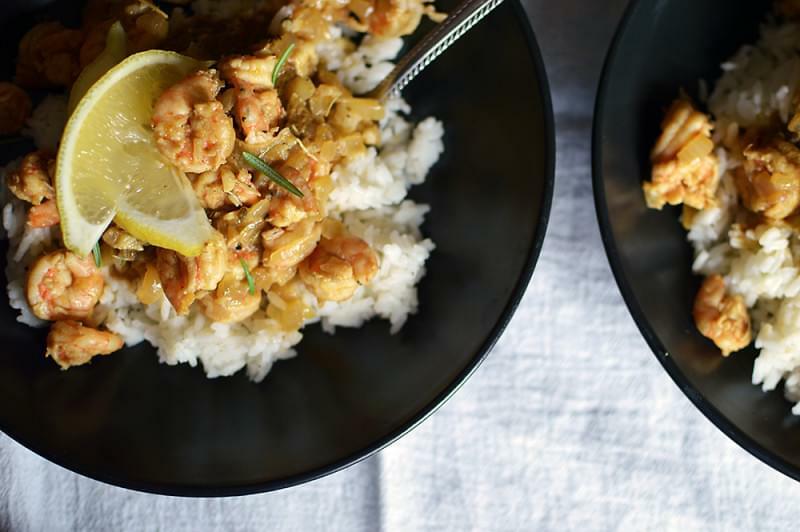 It’s pretty much shrimp cooked in a skillet with a lotta butter, garlic, onions, and spice. All recipes vary a bit, but this is our favorite we’ve found. I’ve had plenty of yummy versions of the barbecue shrimp, but I really always come back to this one and LOVE it. It’s a perfect combination of flavors. You end up with tons of extra butter/lemon/garlic/onion sauce that is just to die for. I suggest you buy (or make) a nice fresh loaf of Italian bread to serve alongside the shrimp. 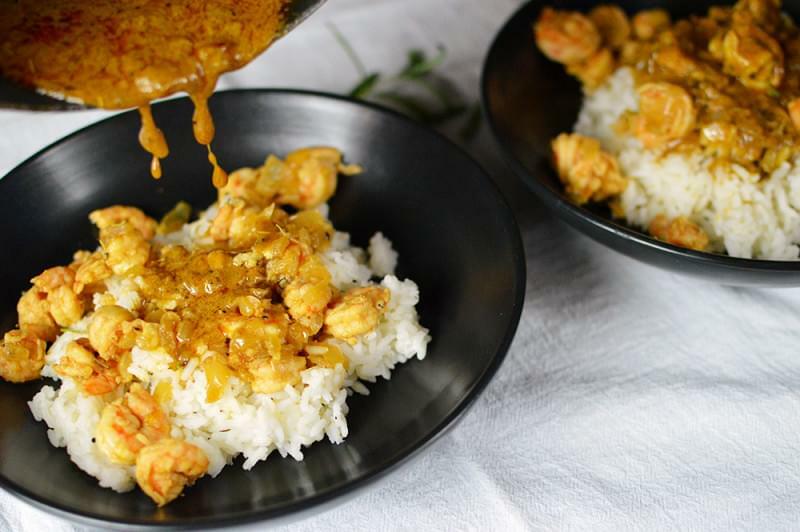 This is the first time we’ve made rice to serve with the shrimp and it’s a great addition to soak up all the extra flavor too. I cooked plain white rice in half water/half chicken broth seasoned with salt and pepper. 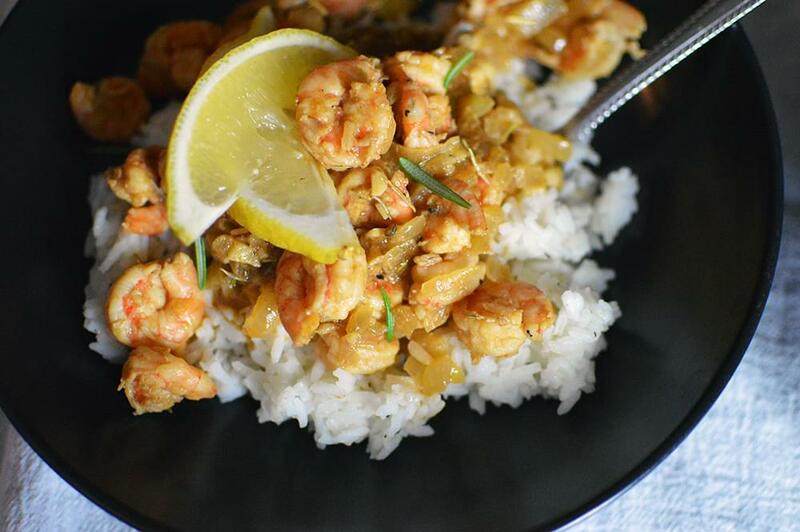 It’s easy to throw the rice in a rice cooker, and let it cook, while you focus on the shrimp dish. Also, don’t forget to heat the bread in the oven for a bit. The entire recipe itself only takes about 20-30 minutes, so its an awesome weeknight meal.